There is no magic potion that will melt away fat. Proper diet and exercise are the best way to lose weight safely. However, you can improve the results of your weight-loss program by adding herbs, vitamins and minerals that help your body burn fat. Make sure you discuss all supplements with your doctor before adding them to your diet plan. Green tea boosts your metabolism, helping you to burn more calories. This is due to the catechins in the tea that help reduce body fat according to a study published in a 2005 issue of "The American Journal of Clinical Nutrition." Green tea's effect is intensified with the addition of caffeine. Try some green tea as an afternoon pick-me-up. Capsaicin is the ingredient in cayenne that causes weight loss. This is due to its ability to help your body break down fat. Not only does cayenne help break down fat, it also helps prevent the development of fat cells in your body. 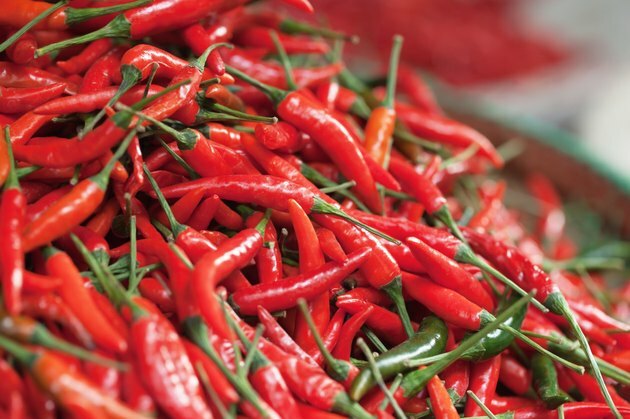 Add a little cayenne pepper to your favorite dish to turn up your boy's furnace. Vitamin C increases your metabolism, allowing you to burn more fat, even while you are at rest. Try adding a glass of orange juice to your daily diet. Vitamin B-12 converts fat into energy. Energy, in theory, is likely to get you moving, which will burn even more fat. Get B-12 from lean meats, fish and eggs as well as fortified cereals. Diets that are calcium rich are associated with a reduction in obesity. Low calcium can cause fat cells to accumulate more fat, but higher calcium reverses this. Get calcium from low-fat dairy products. Vitamin D is needed for the body to absorb calcium. Your dairy products are probably fortified with vitamin D, but your body also makes its own when you spend time in the sun. If you think you need to supplement, discuss it with your doctor first. Licorice may be effective in reducing body fat. It can be enjoyed as a tea, but it should not be taken for more than a week without your doctor's approval. Iodine helps regulate thyroid function. If you have a thyroid disorder, you are likely to have a weight problem as well. Balancing your thyroid can help you lose that extra weight. Kelp works in the same way as iodine because it contains iodine. It regulates your thyroid and also helps boost your metabolism. Cinnamon boosts metabolism and balances blood sugar which aids in weight loss. Sprinkle some on your toast or add some to your morning coffee.